Made from natural herbs and vegetable extracts, Vegemax is free of chemicals and unwanted preservatives, and abundant in various vitamins, essential minerals and dietary fiber. 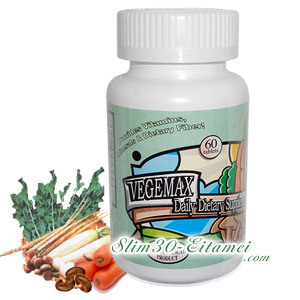 Vegemax Vegetable Supplement is a multifunctional supplement made from vegetable extracts. Its unique patented formula is commonly known in Asia as "Herbal Formula for Extended Life". Vegemax can be taken to help with the following symptoms: constipation, facial wrinkles and spots, cold extremities, gray hair, shedding, etc. The ingredients of Vegemax include burdock root extracts, radish and radish leaf extracts, carrot extracts, and shiitake extracts. These herbs and vegetables contain many natural compounds and innate intricacies that play off of one another in complex reactions. Even modern science cannot definitively describe what they are and account for all the salubrious effects that act to nurture the body. Body cleansing is one of the most important steps in any weight loss, fitness, anti-aging or health improvement programs. Two tablets each day for 3 to 5 days are all you need to observe improvements to your health. Vegemax provides constipation relief and promotes better body circulation in a relatively short period of time. A magnificent combination of both Vegemax and our weight loss products would yield great results.